Real valve tone from transistors? The Blues Cube Hot is perfect for players at any level, from keen amateurs to the most demanding professionals. Tube Logic is a winner. Versatile – great for practice or small gigs. Reliable. Well priced. Great tone. The long-running Cube series of amps has always represented great value; they're compact, portable and the Roland badge means excellent quality and reliability. While Roland is one of the most popular solid-state amp brands, there's a still a general opinion that even good solid-state amps never have quite the same feel and response as valves. However, the Blues Cube could change that, thanks to something Roland calls Tube Logic. More than just modelling, Tube Logic is Roland's new design philosophy, and a radical development from the Blues Cubes of the 1990s - a philosophy that starts at the input socket and extends all the way to the speaker. In between, Roland has duplicated not just the tone, but the organic response and dynamic envelope of a vintage tweed valve amp, using a clever mix of analogue and digital circuits. The Blues Cube Hot is a single-channel design with footswitchable boost and EQ, as well as four output levels, from 30 watts down to around 0.5 watts, to properly reproduce the sound of a valve power stage driven into cut-off at any volume level. The smart control panel is easily understood: there's a single input jack, with knobs for volume, bass, mid and treble, reverb and master output level. Two small illuminated buttons control the Cube's boost and tone features. Next to the shielded power switch is the four-position pointer knob that selects 0.5, 5, 15 or 30 watts of output power. On the rear, there are sockets for a two-button footswitch, together with a headphones socket,line out and a handy USB recording outlet. 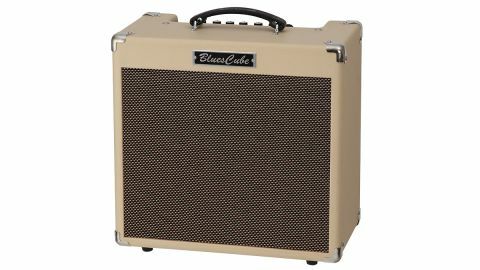 The Blues Cube Hot needs no tweaking to find a great tone; the sonic gratification is instant.Punchy mid-biased cleans combined with snappy treble and tight bass shift to a warm, highly responsive tweed-inspired overdrive as the volume is wound up. The Tone feature returns the Cube to its Jazz Chorus roots with a crystal-clear modern EQ, while Boost adds an extra dose of gain and volume for a truly great solo voice. It's not just the tone that impressed us, though; the Blues Cube Hot has that dynamic squashy response that you expect from valves, flattering single coils and humbuckers alike. At full power, it's loud enough for small gigs, while at the other extreme, the 0.5-watt setting is perfect for home practice and recording, with no loss of tone or feel. Solid-state has come a long way in the last decade, and when amps as good as this one come along, it's hard to deny the benefits. Portability, reliability, consistency and affordability are a given, but great tone is what really counts. But this sounds and responds like a top boutique valve amp, with none of the valve drawbacks.